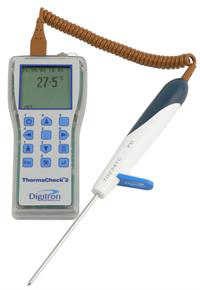 Digitron�s 2100 series of Digital Thermometers has been created to meet the demands of the ever changing food industry. It�s stylish design and enhanced features ensure a quality performance at all times. ThermaCheck� is a simple, reliable temperature recording system for HACCP compliance within the Food Industry. Its simple set up and download procedure from your PC allows easy analysis and storage of your data and eliminates the need to use traditional paper based systems. ThermaCheck� samples, validates and records critical temperature points at multiple locations or process accurately storing over 10,000 readings. ThermaCheck�s management software allows efficient and effective corrective action within food processing, storage and preparation areas.